Animation and images that show Bristol's daily carbon emissions as a volume of gas and a 'share' of the air for the city and its inhabitants. 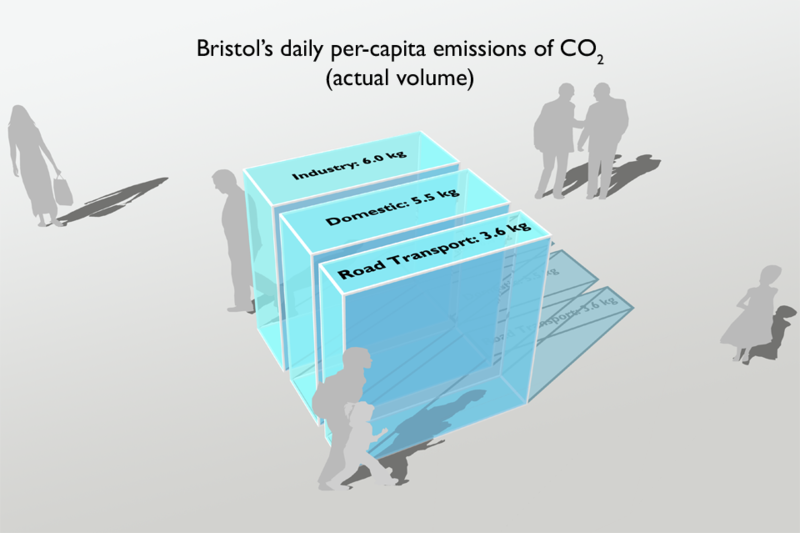 This series of images shows Bristol's daily carbon emissions as a volume of gas. By using College Green, a space familiar with many people in the city, we are demonstrating the power of visual comparison. The work formed part of a residency of Adam Nieman, Carbon Visual’s Creative Director, at the Create Centre, Bristol, in 2012. The exhibition coincided with Bristol's Big Green Week, an annual event that engages the public in green issues and actions. 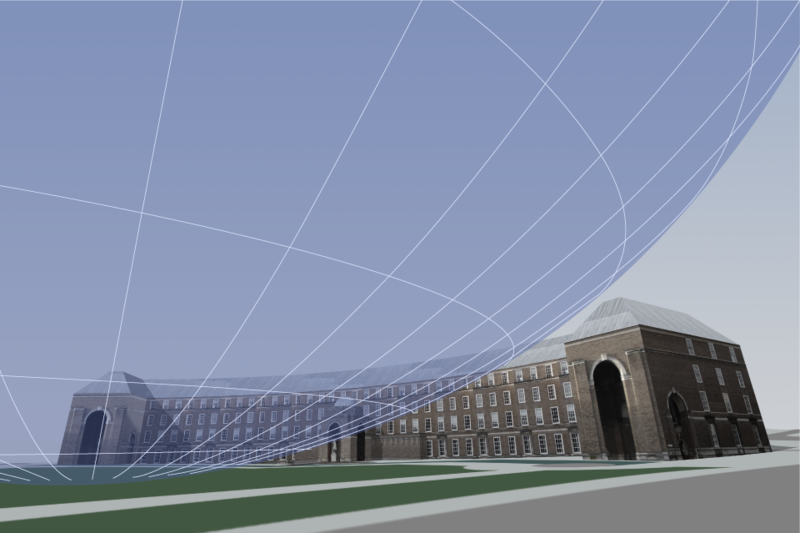 Split into two parts, the aim of these images is to demonstrate Bristol's carbon dioxide emissions, and the 'share' of the air for the city of Bristol and its inhabitants. "These images turn abstract numbers into something Bristolians like me can feel. They bridge the gap between the individual and the city. By using the city itself as an instrument of measurement they humanise the process of quantitative analysis and make it accessible to a much wider audience." Bristol as a whole adds 5,814 tonnes of carbon dioxide to the atmosphere every day. Bristol as a whole adds 5,814 tonnes of carbon dioxide to the atmosphere every day. The emissions would fill a sphere 181 metres across. In Bristol, on average, each person adds 4.9 tonnes of carbon dioxide to the atmosphere each year, which is over 13 kg per day (less than the national average). 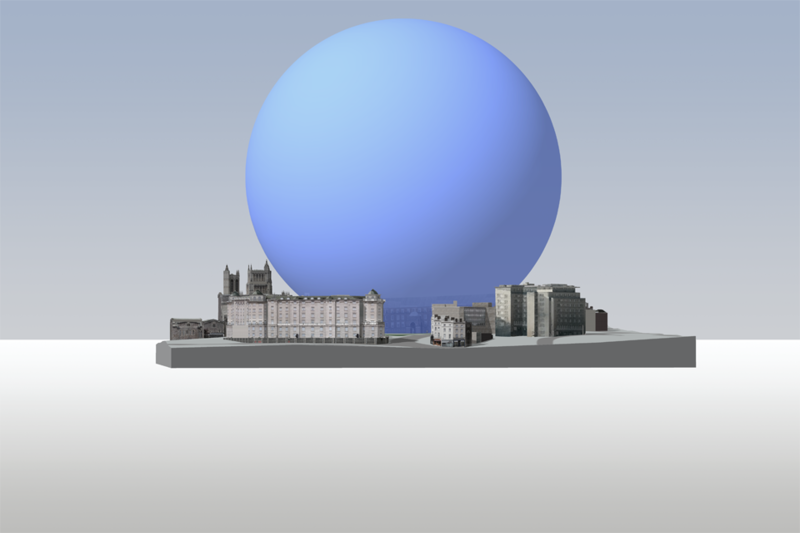 If we shared out the air between each of Bristol’s 441,300 inhabitants we would have 2,516 tonnes each, which would fill a cube 128 metres tall.